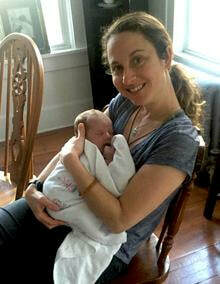 Doulas trained and certified by the Catholic Doula Program are distinguished with an asterisk* or Catholic Doula logo. All training programs are welcome and will be listed! Taking Catholic Doula's herbal course and M.O.M. advocate breastfeeding course. Name: Samantha Alphonso - Doula services. At home, hospital or birthing center. For those who think they can’t afford a doula, I offer an option of consultations at a reduced rate. There is always something that can be worked out to fit the needs and budget of everyone. I became a doula as an Empty Nest career. My four children are grown, and we have two grandchildren. I had one hospital birth and three home births. My favorite part of being a doula is uplifting women where they are, especially with matters of the heart. Many of my clients come to me because they are looking for a Christian doula. What is your website? Include city you serve; Tell us about yourself! Website: http://staroftheseadoula.com I serve the St. Louis and Greater St. Louis Missouri area. I am a newer doula with a fresh unbiased perspective. My goal is to provide my clients with the knowledge, guidance, and support that they need to make their journey or pregnancy and birth a joyous one. ​Elizabeth Harris, RN, CD(DONA), CPD (CAPPA), Fertility Education and Medical Management (FEMM) instructor certification pending. Services provided: Birth and Postpartum Doula, Childbirth Education, Fertility Awareness Education (NFP). Services offered: Birth Doula, Childbirth Education. In Training as Certified Sorrowful Doula* (bereavement) with Catholic Doula Program. Labor and postpartum support for mothers wanting to achieve an unmedicated, vaginal birth at home or in the hospital. I believe in your body to birth your baby! Who did you certify with or are you in training? I have trained with DONA but have not completed my certification yet, I don't like paperwork! hehe! ​Doula Birth trained: BAI, Hypno-doula, ICPD. I hope to create a sacred time for all mothers with their new baby --each child is a blessing from God -- thus the name "Sacred Blessings". Thank you.